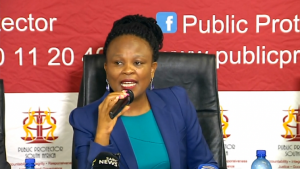 Public protector Busisiwe Mkhwebane hits back at Minister of Finance Tito Mboweni, saying in a statement that the finance minister was “trivialising the serious matter of dishonesty”. The public protector has further expressed concern that the minister has publicly expressed that he has “no confidence” in her. Earlier on Wednesday, speaking at a media briefing ahead of his 2019 budget speech, Minister Mboweni lashed out at the Public Protector’s findings on his Director General qualifying it as “wrong”. He says his department supports Treasury DG Dondo Mogajane. Mboweni further says he will challenge public protector’s report and take it on judicial review. The protector’s found that Magojane had failed to declare a traffic offence conviction when he was considered for the position at treasury. Mboweni has labelled his DG a ‘good Christian man’. “The collective view in the ministry of finance are that the findings of the PP, public protector are wrong . So im taking the decision on review and legal council has already drafted the affidavit . I should have signed it yesterday but dint have sufficient time,” says Mboweni. Mkhwebane had received a complaint that was lodged anonymously in August last year. She says Mogajane failed to act with integrity and honesty towards his employer. The post Mkhwebane hits back at Mboweni’s criticism appeared first on SABC News – Breaking news, special reports, world, business, sport coverage of all South African current events. Africa's news leader..